Oh Boy, what have I done..? I think I have done something incredibly stupid. Unfortunately I am SO Stupid I will carry it out and I have capped off my stupidity by bringing friends along. Yesterday I "virtual" paced a friend of mine for his Ultra. The virtual pacing idea is a "work in progress". Which actually means when someone is making themselves suffer voluntarily, (like run a 50 miler), other people will volunteer to pace and share the pain, even though they aren't even on the same side of the continent! When you run without big shoes on your feet, your pool of running friends can sometime diminish and you have to take drastic measures! The idea was that I ran 8 miles, which although is longer than I have been running, wasn't so far over my usual 10K that I was worried. I actually planned out a route which was 9 miles and it took a biggish hill. Actually it's really a quarter of a mountain, but it would have counted as hill work. The incline was about 650ft over about 1.5 miles; the decline was the same. In between there was a bit of trail and flat road. The actual run itself was quite enjoyable; there was lots of swearing (especially on the Bert Flinn trail; Wow that gravel has grown and reproduced since the last time I was there), lots of wildlife to scare, lots of singing badly and a number of fantastic burps due to my new running fuel, "Swedish Fish". I ached gently at the end, but all in all, I have felt more fatigued after an hour of aquafit than I did after the run. This nice, tame, pleasant run is not the stupidity I speak of; all it has done is make me realise my stupidity! One of my goals next year is to run the Diez Vista 50K Trail Ultra. It's actually based about 15 mins from my house, so I was easily convinced; although I think I just relished the idea of no travelling! It was one those vows I made when my mother died and at the time it seemed like a doable task. Tough but doable. Now all I am thinking is "How the Hell do I do this?" 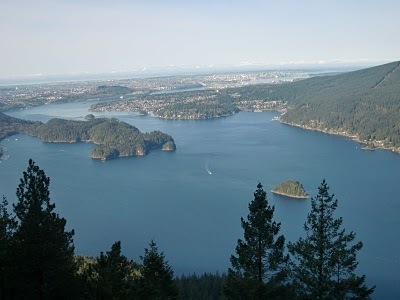 The Diez Vista trail in the Indian Arm Provincial Park has (on further reading), been marked as a challenging hike. The course has in the total of 30 miles, a six-thousand feet ascent and descent over 3 mountains. The trail I think isn't just a little bit of gravel. It's boulders and tree routes and ravines. I have six months to train. Six months to try and learn how to run/hike mountains. Six months to get my milage up to run 50K despite of the mountains. Six months to do all of this, as winter approaches, in a safe manner, (I mainly run alone) and all without breaking myself. This is where I begin to flounder. I have NO idea what I am doing and my usual "carefree" attitude to running, which I forcibly maintain is being challenged. I mean I am actually going to have to sit down and do a *gulp* training schedule. I am going to have to do "pyramid" training, interval training, hill repeats. I may even have to join a *gasp* running club. Even as I type the words I can feel my BP and HR climb to well.. normal levels, (I am a freak - long story... if it wasn't for the fact I was walking, talking and being silly, I would have been placed into hospital with monitors). I also have to figure out how to do all of this training, when I have no training partners to speak of. I truly am a lonely, long-distance, (maybe at a push) runner. How do I get the hill work done when winter hits? Admittedly, we could have a winter like this year and it would be easy. (We had spring blossom in February). However, it could be like the winter before; 3 feet of snow at sea level for 3 weeks. Oh, and I want to do all of this with as little on my feet as I can get away with! Okay, deep breaths.. I can do this. I can do this. I am sure it will work out. I have a tendency for pulling these types of challenges off at short notice. I mean, "how hard can it be?" *grin stupidly* I just have to keep in mind the mantra... "I don't need knees". A Friend of mine is giving away shirts..
And I normally wouldn't repost links on the Blog, but I really want this shirt.. They are all so funny...:) Just don't check out the snorg tee shirt site whilst eating cheerios.. Snorg tee's now owe me a new keyboard! Long time no see... where did the summer holidays go? Honestly where? There "D" was, graduating from pre-school, (please don't get me started on the whole graduation of 5 year olds - you may hear me ranting like an old man), and now he is starting Kindergarten in about 3 weeks time. I suppose my time, especially my blogging time, has disappeared in two main ways. Firstly, it takes an incredible amount of time and energy to keep a 5 year old occupied. I made the mistake of booking "D" into some summer camps, thinking that as he was still attending his Autism center in the afternoon, he would be bored in the morning. An early class would while away the time. This was a BIG mistake. All the summer camps have resulted in doing was ensuring I was out of the house from 9AM and not returning till about 5PM. If I was home at all, it was to grab a quick lunch, check the dishwasher and ensure the house was still standing. (Who know's what experiments "D" would have started and forgotten about?) Honestly I think the dust accumulating on the furniture had more reason to use the house as a permanent address than us. So one bike camp, one skating camp and multiple swimming camps have resulted in a burnt out Mamma, an exhausted "soon not to be" pre-schooler and a house which looks as if it is abandoned. In May I want to run the Vancouver Marathon with some friends of mine, and then a week later I want to run the "Mind The Ducks 12 hour race" on the East coast, (NYC I think). This race had it's first run last year and it was setup by a FaceBook friend of mine. In fact a number of the Minimalist/Barefoot running community went there and they had a blast. I desperately wanted to go, but wasn't able to due to funds. However, I think in hindsight, it was fate telling me to stay home. This was the weekend my mother died, and I think being on the wrong side of the continent, let alone a different continent to my parent's, would not have been easy. So with this in mind, I have been stepping up my training. Not so much distance, but with more cross-training/time. This can only really be done during the weekend, so pretty much most of my weekend is now spent training AND recovering. Training includes a 10K run, 1K swim, 1 hour "Aqua-fit" class, and (hopefully by the end of the year) another 10K run home (preferably with a hill or two in there). I am hoping to do this twice a week with a scaled down version happening once during the week when "D" is in morning Kindy. My third reason, is that I have started to document my journey which will be happening over the next 12 months. Yep, I am writing a book. Have no fear, I am fairly sure that it won't be foisted onto the public. It's purely a personal thing for me. A way to grieve over my Mother, a way to show my son what can be achieved and a record for me; to remind me that I can do all the goals I set myself. Documenting the next 12 months is also ensuring I actually follow through with my goals. Every time I open my laptop, I see the document there, reminding me that I need to run; I need to train and that I need to do all of this without irreparably hurting myself in the process. The last point maybe the hardest to achieve. As I have said before "we don't need knee's, right?"